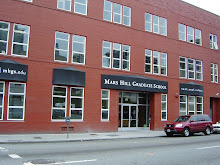 The school I attend, Mars Hill Graduate School (MHGS), sits in a beautiful area of downtown Seattle, just one block from the water, overlooking the Puget Sound. I couldn't be happier that its location allows me to walk the streets of Seattle each day, taking in the diversity a downtown metropolis has to offer. Until a few years ago the school was located in a business complex in Bothell, a suburb of Seattle. I cannot imagine studying in any other building than the one we are currently in. It would just not be the same. At the same time, too, the location has a number of different ironies that make it an intriguing place to do seminary (more on the second irony in an upcoming post). Mars Hill sits sandwiched in location between an upscale hotel and a non-profit organization that reaches out to Seattle's homeless and poverty-stricken population. To our west we are faced with the wealth of our country, and to the east, the poverty. We find ourselves in the middle, trying to navigate life in this ever-increasing gap. This is definitely an interesting tension to have to balance. As I spend these three years preparing for a life of vocational ministry, I must be willing to step into this often awkward tension that has been created in our society. As a pastor, will I be willing to walk this tightrope? Will I not let the rich of my congregation sleep easily in their greed and selfish ambition, but be strong in calling them to new levels of devotion to God, especially monetarily? With the poor in our community, will I be gracious and compassionate, but yet strong in calling forth hard work and dedication in producing sustainable living for themselves and their families? And most importantly, will I help lead the kind of community where both sides of the coin (pun intended) feel welcomed to the conversation? Will we produce dialogue amongst us that asks challenging questions and seeks hard answers, but ultimately leads to an active pursuit of justice and peace in our world?